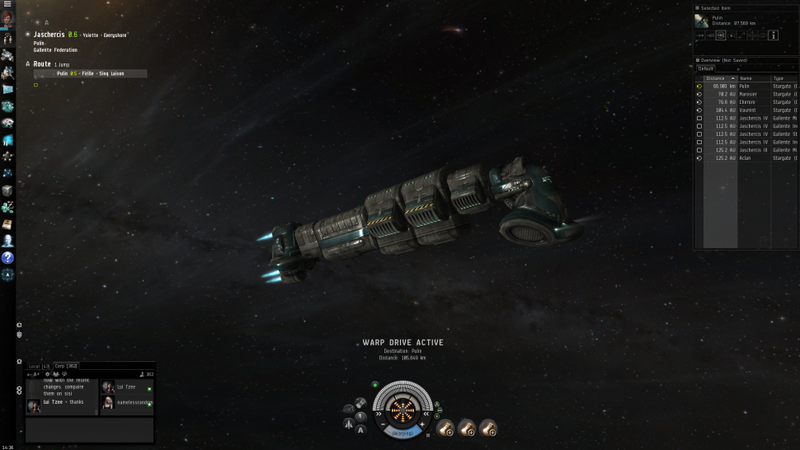 You may have noticed the Kotaku post shared on the io9 mainpage about the epic battle raging today in EVE Online. But EVE involves a lot more than one star system so many players had nothing to do with the battle. So this is what I was doing in the game today. The top image is of one of my industrial ships (read cargo ship) that I was flying through several systems to move ores and minerals from where I mined and refined to the system where I manufacture things, mainly ammunition. I then flew the ship through several more systems to the trading hub where I put manufactured goods on the market at what I believe to be a good price. Before hauling I had to mine first. The only weapons I fired today were mining lasers. My complement of drones did take care of some NPC pirates who wandered by though. Was my day in EVE exciting and filled with pew-pew? No. But I don't mind. Not every day needs to be filled with excitement.